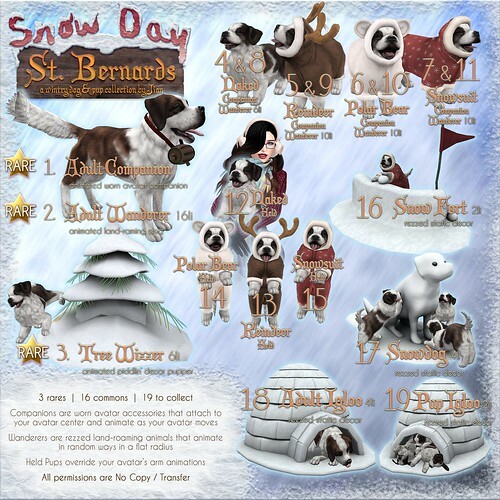 JIAN: Snow Day St. Bernards & Kringle's Kittens @ The Epiphany! Snow Day St. Bernards & Kringle's Kittens @ The Epiphany! Both available NOW @ The Epiphany! All the best parts of a snow day -- WITH YOUR DOG! Peein' in the snow, wearin' cute snow suits, huckin' snowballs, buildin' snowpuppers.. chillin' in an igloo that took you two full days to build because holy moly making bricks out of snow is so much work. This set has all that stuff AND a brandy barrel! 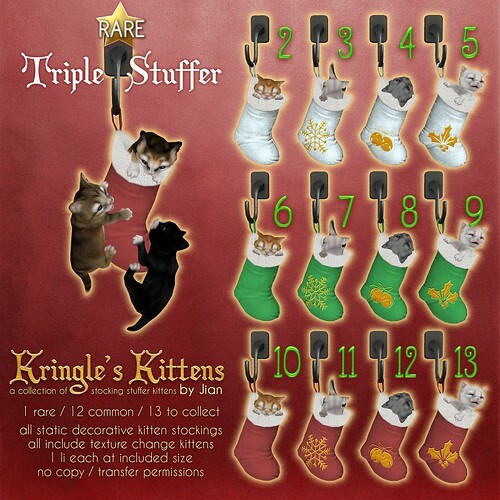 Precious lil stocking stuffer decor kittens. Deck your halls, yo. You can get them at the main Epiphany sim HERE or at the mirror sim HERE!